CA-Intermediate exams are fast approaching. How are your preparations coming up? Are you ready to go all out in the final phase of preparation? With just 30 days left in hand, now is not the time to go giddy with nervousness. Now is the time to double up the efforts and gear up for battle. Right now is the time to stay calm, and knit an infallible strategy to clear Group II in 30 days. Let’s begin, shall we? The air is thick with rumours about how hard it is to crack CA-Intermediate in one attempt. How you prepare for CA-Intermediate Group II in these remaining days will determine your chances of success. Our experts are here to help you to plan your study strategically just one month before the exams. Let’s get started, shall we? The final month before CA-Intermediate exams is also the final phase of your learning. Our experts term this phase as ‘Revision Phase II’. The learning phase begins months before the exam, and is closely followed by the first round of revision. So, ideally, 30 days before the CA-Intermediate exam you should be doing your second round of revision. These 30 days are extremely vital. You will need to plan properly to ensure that you can score maximum marks. As per the new syllabus, CA-Intermediate Group II exam is conducted on 4 subjects. There are 2 practical papers: Advanced Accounting and Financial Management and Economics for Finance, and two theory papers: Auditing and Assurance and Enterprise Information Systems and Strategic Management. Phase 1 contd. For the next 4 days, you can finish revising the theory portions that are yet to be covered. *No new theory or practical topics should be touched during the last 30 days. Ignoring ICAI’s study material – Everything that you need to know about clearing CA-Intermediate Group II exams is in the study materials. The study materials are published by ICAI to give students a clear idea of the scope of syllabus for each subject. It delves deep into the concepts and represents them diagrammatically for the benefit of the students. Studying from the study material is the surest way of scoring 60+ in CA-Intermediate Group II. Ignoring attempt specific inclusions and amendments – As you know that the first question in any paper is a compulsory question of 20 marks. There are high chances for this question to come from amendments and inclusions introduced by ICAI specifically for your attempt. Neglecting presentation of answers – This is especially true for papers like Auditing where students are required to quote legislations or sections. Quoting sections appropriately will not fetch any additional marks but not quoting them at all or quoting them wrong will take away big chunks of marks from the exam paper. Illegible working notes – This holds true for practical papers in Group II. Working notes are as important as any other part of your answer. Through the working notes, you can showcase it to your examiner that you have a firm grasp on the concept. If your working notes lack clarity or cleanliness, you lose marks in your exam. To add to this, our experts are of the opinion that ignoring mock test papers and previous year question papers may prove to be detrimental for students appearing for CA-Intermediate Group II exams. 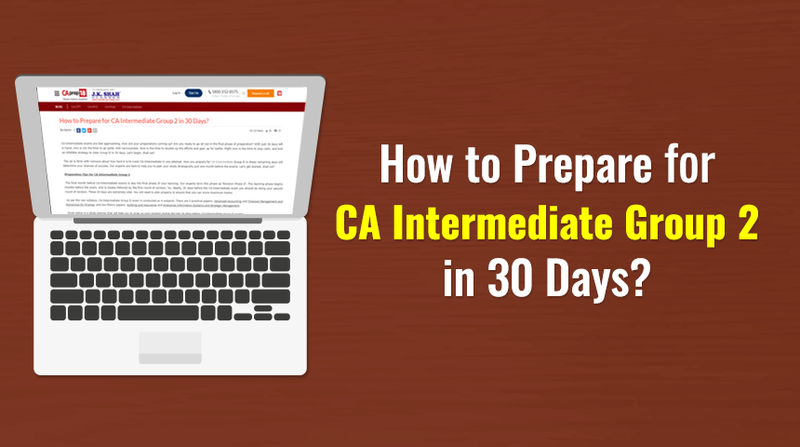 The study planner along with the factors pointed above can guide you to effectively prepare for CA-Intermediate in the last 30 days. These will ensure that you score above 60 in your exam provided that you follow it up with work hard and calculated efforts. Everything said and done, the last thing you would want to do is fall sick before the exams, so take good care of your health even as you prepare for CA-Intermediate Group II exams.